H.A.R.T.’s 5th Annual Italian Feast!! 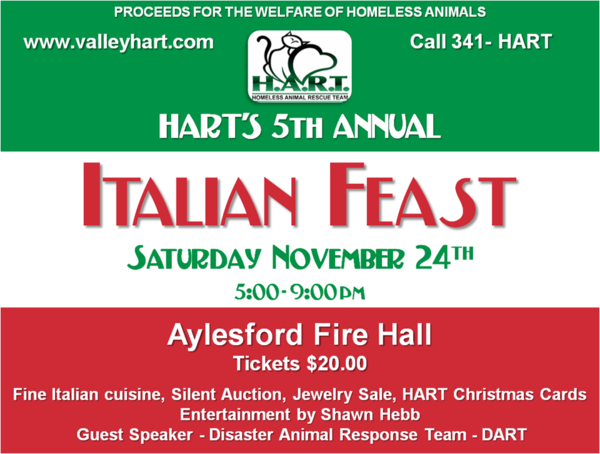 This year our Italian feast will be held on Saturday, November 24th, from 5 pm – 9 pm at the Aylesford Fire Hall. Tickets are $20.00 each. This is our biggest event of the year and OH SO YUMMY!!!!! The menu will be posted shortly. Advance tickets will be available as well. The meal will consist of your main entree, garlic bread, caesar salad, beverage, choice of dessert and tea or coffee!! There will be a silent auction, and many items on display for sale! (Jewelry, bake sale and other crafts). There will be a guest speaker from DART (Disaster Animal Relief Team). We will confirm shortly the time of this speech. We are pleased to announce that Shawn Hebb will be singing and playing accoustic guitar for most of the evening!! This entry was posted in Fundraisers, Nova Scotia and tagged adoption, animal rescue, fundraising, halifax, nova scotia, rescue by Raquel. Bookmark the permalink.